Please contact us today to schedule a visit! Mike started visiting schools after one of his neighbors, who had modeled for a book cover, took the book to school and showed his teacher. The teacher at first did not believe that he was on the cover of such a renowned author’s book. She asked how he was picked to be on the cover and he replied that he lives next door to the artist. The teacher asked if the artist would be interested in coming to visit their school and talk about his work as an artist. That was in 1990 and Mike has been traveling all around the United States visiting schools ever since. He has visited small country schools in the Appalachians to the large inner city schools of major metropolitan areas. From elementary schools to major universities, his workshops have been a rewarding and a deeply personal experience for the artist and the audience. Teachers constantly praise Mike for his ability to connect on the children’s level. “He brings so much enthusiasm and sincere friendliness to his visits that it’s almost like having family come for a short stay,” claims one librarian from the Houston area. Mike with Bartlesville public schools art teachers after a professional workshop. Mike’s school programs are appropriate for all ages from kindergarten through the university level. Each is directed to the appropriate age level for time and content. He schedules one school per day and gives two one-hour presentations for third through sixth grades, and two half-hour presentations for kindergarten through second grade. Another option is three one-hour presentations for third through sixth grades, if the school would prefer that he only speak to the older kids. For the schools that want to share Mike’s time and his expenses, he can break up the visits into: three different schools for a one-hour presentation each; or two schools for a one and a half-hour presentation each, with each school sharing the daily expenses equally. 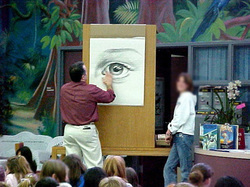 When Mike talks to middle school and high school students, he wishes to speak only to those students who are truly interested or who would be greatly influenced by his presentation, such as the writing or art students, and those that may seem like problem students but show a knack or interest in drawing or art. These presentations last for approximately one and a half hours and are more in depth about illustration as a career. K-2nd Grade Presentations last 30 minutes and consists of Biography Presentation, Q&A, and drawing demonstrations. 3rd-6th Grade Presentations last 60 minutes and consists of Bio Presentation, discussion of work, project scope, Q&A and drawing demonstrations. 7th-8th Grade Presentations are similar to 3rd-6th with more age-appropriate display. HIGH SCHOOL Presentations can be delivered to specific groups, such as writers, artists, historians, and other general groups. Biography, personal work, professional projects are also presented and discussions are based on professionalism and growth, independence and self-learning, making major choices in life, and building quality over time. 1. Prepare the students for my visit by introducing my books & my artwork by visiting my website, and download Mike Wimmer School Bio/Book List at the bottom of this page. 2. Discuss the difference between authors & illustrators. 3. Maybe the kids could write or illustrate their own book projects. 4. Use the book/s as a starting point for class projects e.g.. Transportation w/ TRAIN SONG or FLIGHT, or maybe biographies w/ FLIGHT, WILL ROGERS, OR HOMERUN, or maybe they could write a journal that speaks of each family member’s favorite place as in ALL THE PLACES TO LOVE. 5. Download the THEO POSTER and ACTIVITY SHEETS at the bottom of this page from “Theodore”. It’s a great way to introduce my visit and learn about one of our nations greatest Presidents. You can work through your local book supplier, or Mike can provide books for his school visits, if you would like. Each book requires a minimum order of 25. Any books not sold can be returned for a minimum return and handling charge. Mike is available for school visits and book signings and enjoys reader’s comments and questions. His fees are: $1,500.00 per day for local+travel expenses (Oklahoma) schools, and $1,800.00 per day (all expenses included) for those visits that require Mike to spend the night. Elementary visits consist of 2 1/2 hour and 2 1 hour presentations with book signings in between (see above explanations of presentations). HS visits will work around each school’s needs for timing. Mike is willing to work with combined schools to assist in shared fees. Payment for school visits are expected at time of presentation.